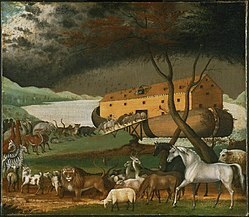 Noah's Ark in an 1846 painting by the American folk painter Edward Hicks although since this is so long after the event we can't be entirely sure of its accuracy. The Welsh are an old and wise people and Wales is an old and wise land, so on hearing a little time ago that parts of its neighbour England were enduring a drought, the land began taking precautions and has been collecting and stockpiling rainwater ever since, whilst its people carry on about their business knowing that their water supply is in safe hands. This has given me an opportunity to do, and few excuses to avoid doing, some work on upgrading the Almanac app so that it runs on both iPads and iPhones. Technically this turned out to be surprisingly simple, the time consuming part is working out how the app should flow and display information on the bigger screen, whilst being recognisably the same and with the same functions. The decision you make at times like these, unless you are a large corporation with access to lots of focus groups or similar, is to do what pleases yourself and then hope you are not alone in liking the outcome. Then as you finish and start testing, trying to look at things with a dispassionate eye, voices start whispering words like “quirky” and “idiosyncratic” in the back of your mind. Well so what. Those voices were no help when you couldn’t decide what to do, so why listen to them now. Critics don’t make things. On the other hand critics can help improve things, maybe I’ll just have a fiddle with that bit … No, I’ll be strong, I can always change it in the next release. So that’s that then. All the heavy lifting is done, so after a couple of days of testing I will be able to pass it to the app store for approval. This is usually the best time of year for rainbow spotting around here, but this year I haven’t seen one yet. Last year, for the first time in my recollection, I saw a double rainbow. In fact I saw three on separate occasions. I didn’t know until then that the colours are reversed on the second rainbow. I have been on the lookout for a while as I make trips over the Black Mountains through the rain, I’m sure it will be worth the wait. 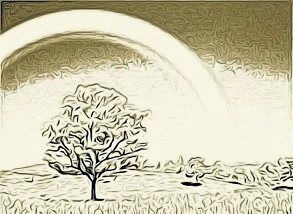 Rainbows are one of those phenomena that are entirely out of place, full of colour on a grey day. They are also always uplifting and worth stopping to have a good look.